Lone Survivor is well made and well acted but its refusal to pass comment on the central mission means that it ultimately feels like a gung ho fantasy that lacks emotional impact. Directed by Peter Berg (Battleship), Lone Survivor is based on the memoir by Marcus Luttrell and set in Afghanistan in 2005. 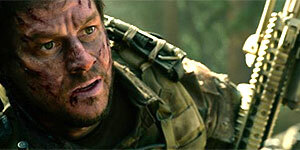 Mark Wahlberg plays Navy Seal Luttrell, who leads a team of fellow soldiers (Taylor Kitsch as Michael Murphy, Emile Hirsch as Danny Dietz and Ben Foster as Matt 'Axe' Axelson) on a mission to capture or kill a notorious Taliban leader (Yousuf Azami) in the Afghan mountains. However, things quickly go wrong when their position is discovered by some local goatherds and a young child, and soon, they are fighting for their lives in deeply inhospitable terrain, pursued by a seemingly ever-increasing number of gun-toting enemy combatants. The four central performances are convincing and surprisingly well rounded for this sort of thing, even if Wahlberg is at least fifteen years too old for the part he's supposed to be playing. In addition, the action sequences are extremely well staged, with Berg ensuring that the breathless second half of the film is wall-to-wall gunfire, tension and bone-crunching violence, though he can't resist the odd bit of unnecessary glorification, e.g. showing the men leaping off a rocky cliffside in slow motion (which backfires because it looks almost comical). Unfortunately, any hint of suspense as to the film's eventual outcome is rather diminished by the combination of the title and the “Based on the book by Marcus Luttrell” screenplay credit at the beginning. However, the film's biggest problem is that, despite being based on a true story, it comes across as a flag-waving, gung ho fantasy – in particular, it's impossible to tell whether the filmmakers have any opinion on whether their initial mission was worth the loss of life or not; instead, it's presented at face value, so there's no indication of the soldiers themselves being aware of the senselessness of what happens to them, which significantly lessens the film's dramatic impact. On top of that, the first half is painfully slow (the sequence with the goatherds seems to go on forever) and the film is further undermined by an overdose of forced sentimentality at the end, in which you're forced to sit through what feels like an entire Facebook album's worth of photos of real soldiers, as opposed to a more respectful single shot of each. As gung ho action thrillers go, Lone Survivor is an efficient shoot-em-up with strong performances, but the film deliberately avoids questioning the senselessness of their mission, which feels uncomfortably reductive and lessens the film's dramatic and emotional impact.